When I moved to Huntingdonshire – to Godmanchester, actually – in 1987, from St Helens, probably the last thing on my mind was politics. Settling into an area which was new to both me and Ailsa, we quickly started to enjoy our new life in the South, and we have lived down here ever since, moving to Hartford in 1995. 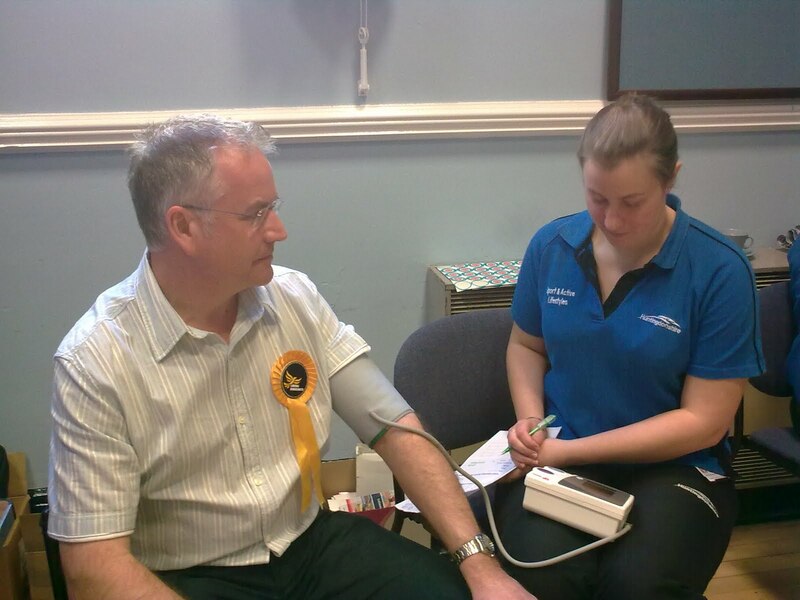 I joined the Liberal Democrats for two reasons: I liked their national policies, but I was impressed with the way they communicated LOCALLY with the electorate, all the year round. I have never been keen on any system which sees a large majority, whether that was the Thatcher government of 1983 or the Blair one of 1997. 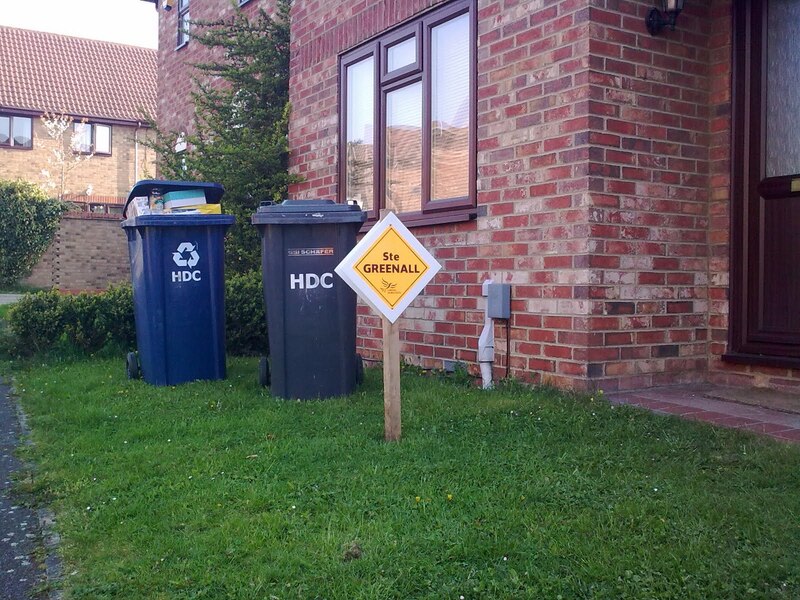 Nor, come to that, the majority of Conservatives on the Huntingdonshire District Council. There needs to be a balance of views; a different opinion, if you like. But other than putting leaflets through doors, I have never been “active” in politics before. So why should you vote for a bloke who has real NO political experience....or should I say, HAD no experience until he started knocking on your doors? My answer is that you have to start somewhere, and sometime. My time is now. I am an accountant, though people who have worked with me would say I am anything but a typical one. · For four years, I worked for Homepride Foods in Cambridge – I was Fred the Flour Grader’s money man. · My present job is Financial Controller of Pro-Spray Automotive Finishes Ltd. We are now based in Biggleswade after a serious fire threatened the company’s future. I steered the company through a £4.5 million insurance claim, and we are doing well in our new HQ. Our current credit rating is 97 out of 100. · I was PTA Chairman at Houghton School for a year, and drew up the financial case for lottery funding for Houghton School’s very successful Out Of School Club. · I have been heavily involved with Youth Football – Brampton Spartans – for eight years. I won the Hunts FA Administrator of the Year award four years ago. · I have been the Snowy Way Neighbourhood Watch co-ordinator. · I have had a family membership of Hartford Conservation Group for 8 years. I hope that gives a brief flavour of the drive, professionalism and enthusiasm I have for my work and my spare time. I will bring all of that experience with me if elected. Huntingdonshire District Council faces severe financial problems in the years ahead. I will use my expertise to make those figures understandable, in simple terms, to the people of Huntingdon East, and beyond. Looking at the Council’s own current projections, the reserves they built up over the years are going to run out in 2014. That is just four years away. The Council has been relying on interest earned on its reserves. If you have a savings account, you’ll know how the interest you earn has fallen away, and if you have a level of spending that you don’t cut, you have to eat into your savings to keep going. 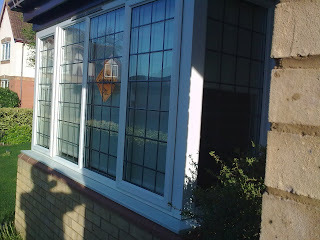 That’s what the Council have been doing, and borrowing as well, to help pay for the new Pathfinder House. The Liberal Democrat group on the District Council has a voice, but we need it to be a louder one. Nationally, the Tories have been saying how, after thirteen years in power, the Labour Government is tired, and there is a need for change. Locally, I believe there is a need for change. More Liberal Democrats are needed on your Council – the one which sets your Rates and spends your money. The statement that politicians hear views "at the doorsteps" is a very true one. I have had, for example, immigration, the guided bus, MPs expenses row, closure of Huntingdon toilets, council tax, jobs in the public sector and Hinchingbrooke Hospital, plus many more, but specifically those. The last one in particular is dear to me. I have twice had brilliant outpatient treatment there, but I shall always have a huge fondness for the place as Ben was born there in 1994. 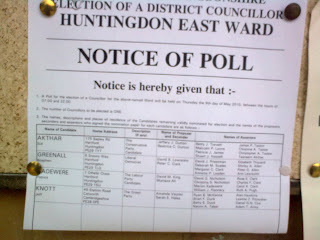 I will pledge, if elected in Huntingdon East, to learn about the issues from all sides, but of one thing I am sure. With much uncertainty surrounding the future of the hospital and how it works, I will use every endeavour to keep it in our community, and in the hands of the NHS. I will seek to talk to all, from union reps, cleaners, nurses, office staff....right through to those who by the stroke of a pen on a contract, decide how it will be run. The situation with toilets in town would be laughable, if it were not happening before our eyes. Money spent on refurbishments, wasted because the loos are locked. I thought the District Councillors wanted to encourage people to visit the town. Seems that idea is 'down the pan'. Lib Dems on the District Council tell me that alternative proposals fell on deaf ears. Ah well, if elected, I will shout down those same ears. The guided bus. Well, David Cameron is on record so many times of saying how the Conservatives will cut waste. Pity he didn't get the local Conservatives "on message" when they voted through £300,000 worth of "corner cutting" in Hartford. Sadly, Councillor Dutton, pictured in the Hunts Post complaining about the situation, either did nothing, or not enough, to persuade his fellow Conservatives on the council that it was a bad idea. I'll give Jeff credit for at least saying it was a waste of money. If elected, I shall be asking how many buses per day are using that road, and how much time is saved. As an accountant, I look forward to reviewing the Council's accounts, as from what I am led to believe, problems lie ahead. I intend to make a start by proposing that ALL Councillors take a 10% cut in expenses and emoluments. It may be a small gesture, but it will help when trying to explain any future cuts which may happen. Above all, I will bring the same enthusiasm, vigour, drive and fresh approach, locally, which Nick Clegg has brought nationally. Whatever happens on May 6th, you can be sure that in Huntingdon East, Lib Dems will be working for fairness. 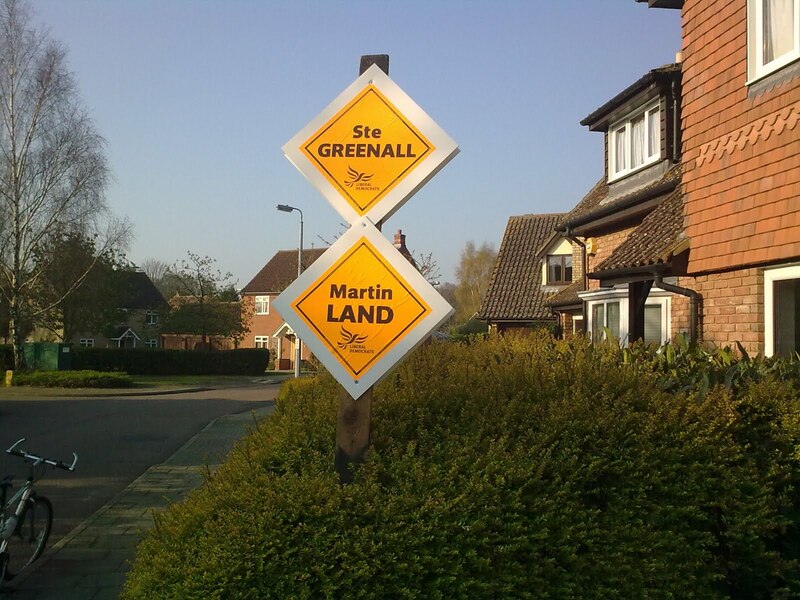 People are starting to realise that a vote for the Lib Dems is NOT a wasted vote, and in Huntingdon East, it is a vote for action, not words. On-line encyclopedia WIKIPEDIA has a page listing famous diamonds. For some reason, it is yet to list the recently discovered Greenall Diamond. Printed on Liberal Democrat orange, with bold black writing, this strain of diamond has been found recently in various parts of the town of Huntingdon in Cambridgeshire. Sometimes affixed to wood by means of a white backing and screws, this flawed gem has also been seen in the windows of homes. Experts have been baffled by the sheer numbers of these previously rare stones, but they predict that they will be around for some time to come. I hope I can get one of these for my scrap-book, for when the campaign is over. ....well, I tell a fib. He came up to one of our people, David Lewisohn, and showed him a poster he had made for his car. It said "I am 72 and have voted Tory all my life. Not any more." Anyone with interest in politics would have to agree that this campaign has been unlike any before it, with style being measured as well as substance, but with people REALLY taking more than a passing interest in what is going on. A house that we canvassed earlier this week has yielded an excellent site for displaying a board, and here it is, in all it's highly visible glory, seen by thousands daily. Apologies all, I managed to lock myself out of my Blogger password and in the pressure-cooker atmosphere of the local elections, I managed to keep myself locked out. But it's good to be back. Be nice to those who are probably not going to vote for you, but even nicer to those who are! In the case of number 10, I have failed miserably! At the time of writing there is less than a week to go now before the polls open. Over the weekend, and because there simply isn't enought time/space to put a full description of what I am about on the last leaflet we deliver, I will post it on this blog, so you can read more, always assuming you want to, of course. 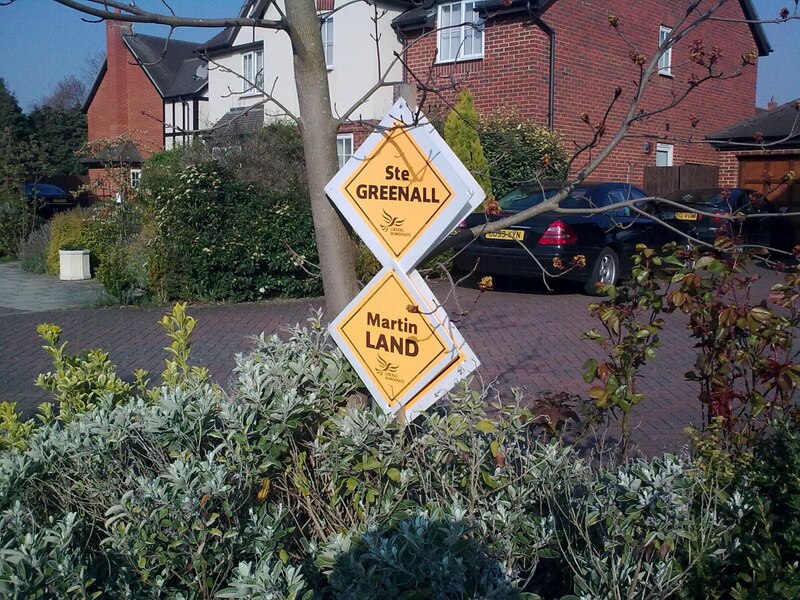 With a few short days of campaigning left, most of The Birds Estate has been covered and the rest will follow. After that, it's a case of filling in the gaps, and persuading more people to support my campaign. 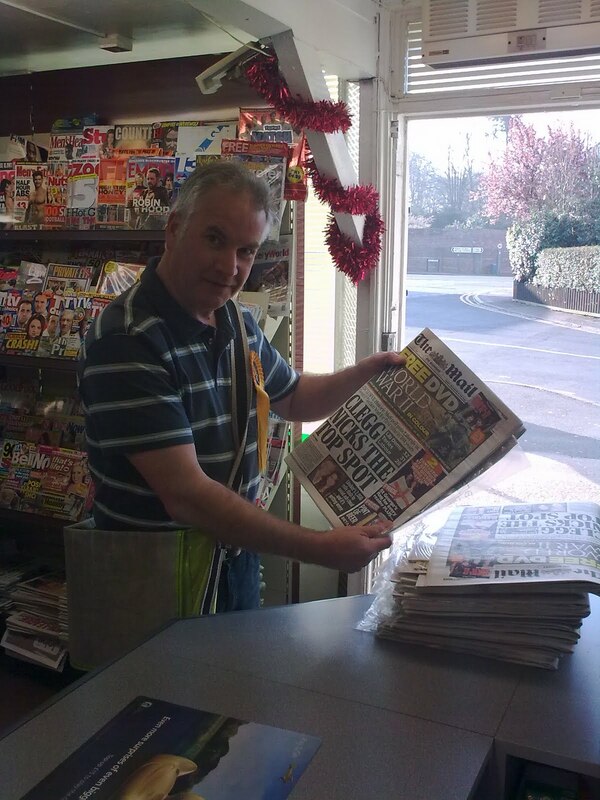 Can't wait to get out again today and keep the campaign going, but having done the papers first thing, and seen another diamond, the next job is to go into town and get the shopping done. 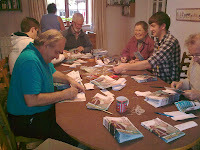 After that, there's the small matter of making sure that the various helpers we have deliver the leaflets that arrived last night. The way it works is that the 'constituency' is divided up into chunks of about 800 homes, and then subdivided to about 100, and bundled, so each distributor can do 100, and not take up too much time. I did have input into my parts of the leaflet, but the back of it has a message from Martin Land, who is standing for MP, and Nick Clegg. And one of Nick's lines is......A strong vote for the Liberal Democrats .....means an end of the stitch-up between the two old parties. The Sky TV debate on Thursday did see David Cameron make a stronger showing, but he had to; as I thought the week before he was poor. Not that I am complaining. But if Thursday were a boxing match, you would have to say Cameron failed to land a decent punch. Don't we all have occasion to see a photgraph of ourselves and think "Oh no....look at that lardy bloke". I do anyway. Not that we should ALL think that way. But for someone who preaches careful eating and exercise to my teenage son, as you can see, I don't practice what I preach! However, with thanks to Ian Percy, who runs each weekend with me, here's someone genuinely running for office, with my LibDem rosette. Ian and I take a 7 mile run, from Houghton, across the meadow to Hemingford Abbotts, then Hemingford Grey, back into St Ives over the town bridge, and back to Houghton down the Thicket. Two weeks of canvassing to go, and I am gradually getting through the piles of work needed, with lots more doors to knock on. This board is in the garden of two lovely people, both strong Lib Dems, but who have never had a board before. I had a had a long chat with them on Tuesday. 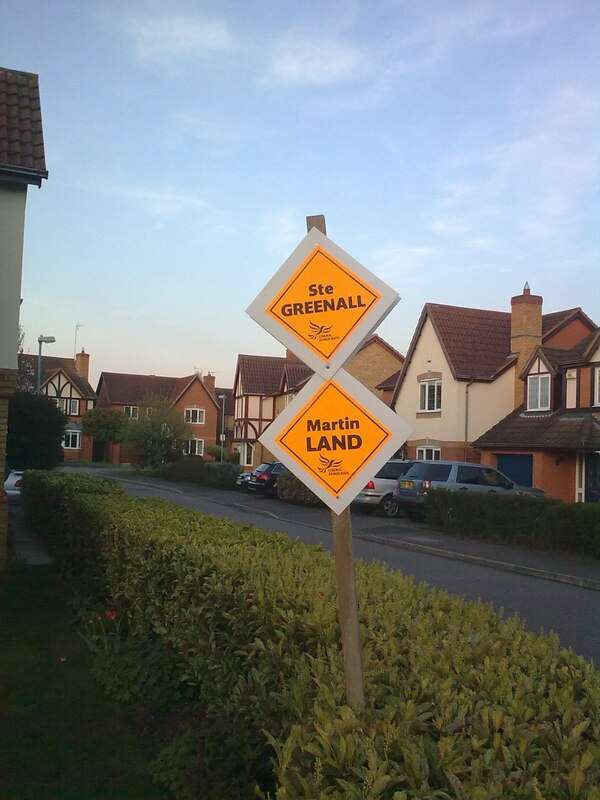 As a result of the board going up, three Greenall Lib Dem diamonds will soon be on display as well in other houses. The house with the board also has a diamond in the window, and three other houses have taken diamonds tonight. 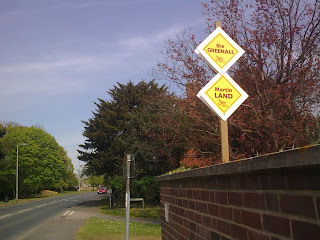 The campaign is going well so far, but there is a long way to go, and lots of houses to knock on. 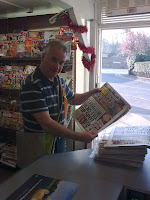 I had the chance to proof read the latest leaflet which will be printed soon - in Upton, Huntingdon - for weekend delivery. Mr Djanogly has faced criticism for failing to practice what he preaches, and instead of having his leaflets printed in his constituency, instead they are printed 100 miles away in Guildford. I am pleased to say our are printed in Upton. We have a local man, who knows the area well, and uses local business. What are the issues I am campaigning on? The statement that politicians hear views "at the doorsteps" is a very true one. I have had, for example, immigration, the guided bus, MPs expenses row, closure of Huntingdon toilets, council tax, jobs in the public sector and Hinchingbrooke Hospital, plus many more, but specifically those. The last one in particular is dear to me. I have twice had brilliant outpatient treatment there, but I shall always have a huge fondness for the place as Ben was born there in 1994. 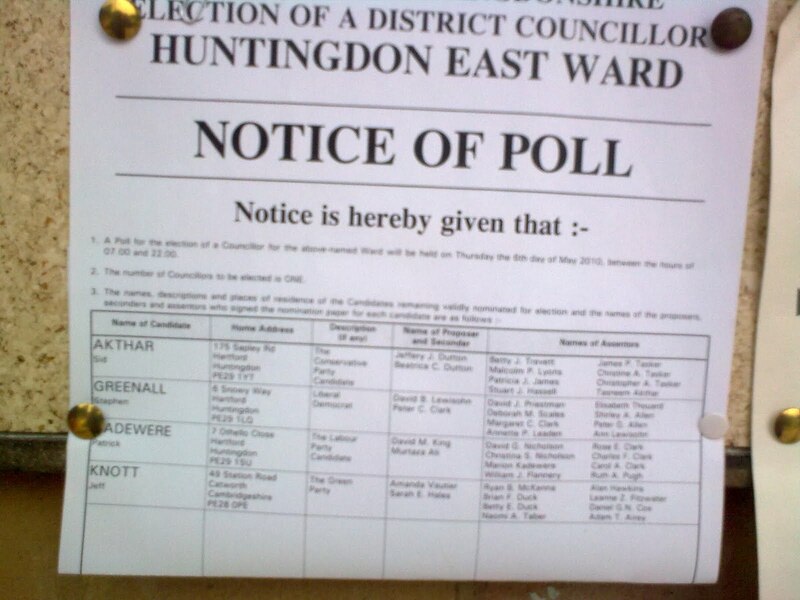 I will pledge, if elected in Huntingdon East, to learn about the issues from all sides, but of one thing I am sure. With much uncertainty surrounding the future of the hospital and how it operates (I mean as a public facility, not as in taking someone's appendix out ;-) I will use every endeavour to keep it in our community, and in the hands of the NHS. I will seek to talk to all, from union reps, cleaners, nurses, office staff....right through to those who by the stroke of a pen on a contract, decide how it will be run. The guided bus. Well, David Cameron is on record so many times of saying how the Conservatives will cut waste. Pity he didn't get the local Conservatives "on message" when they voted through £300,000 worth of "corner cutting" in Hartford. Sadly, Councillor Dutton, pictured in the Hunts Post complaining about the situation, either did nothing, or not enough, to persuade his fellow Conservatives on the council that it was a bad idea. I'll give Jeff credit for at least saying it was a waste of money. If elected, under the Freedom of Information Act, I shall be asking how many buses per day are using that road, and how much time is saved. As an accountant, I am looking forward to reviewing the Council's accounts, as from what I am lead to believe, problems lie ahead. I intend to make a start by proposing that ALL Councillors take a 10% cut in expenses and emoluments. It may be a small gesture, but it will help when trying to explain any future cuts which may happen. Above all, I will bring the same enthusiasm, vigour, drive and fresh approach, locally, that Nick Clegg has brought nationally. 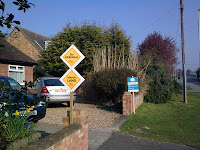 Whatever happens on May 6th, you can be sure that in Huntingdon East, Lib Dems will be working for fairness. 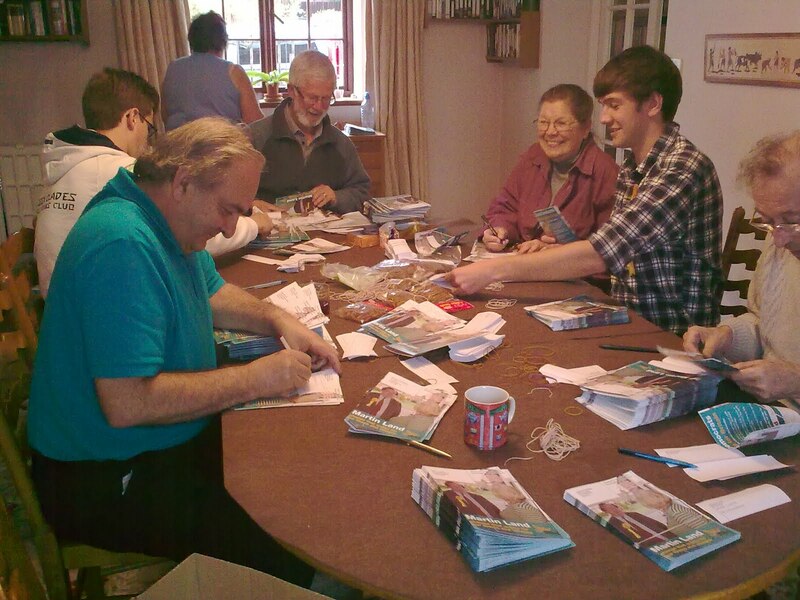 Young and old alike, putting together the large mailshot that will be in the post by now and on its way to the postal voters. 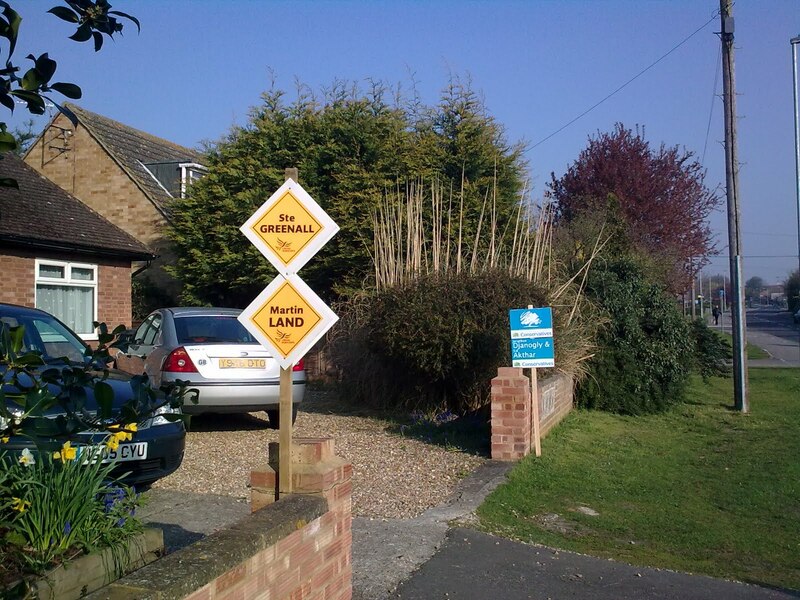 Not that the Lib Dems are doing things any differently to the Tories. In fact I KNOW the Tories did such a targeted mailshot as they sent one to Ailsa today. 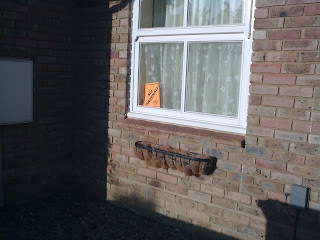 (proving you can't ALWAYS believe what you get told on the doorstep!) Mr Djanogly is pictured on his leaflet claiming "a record of action". I love the picture of Mr Djanogly outside a school, not for the faces on the kids around him, but the bloke in the background looking distinctly bored as he looks in the opposite direction out of a window. But here's something you should note. In that same leaflet, Mr Djanogly lists "3 Positive Reasons to Vote for (him)"
Third one being "Jonathan promotes commerce in Huntingdonshire". It goes on to say that he "......visits locals businesses every month. Being a Shadow Business Minister means Jonathan understands the concerns of companies and the importance between politics and industry" It then notes a link to www.jonathandjanogly.com/business. So I visited that link. The page was blank (11.30 pm, Tuesday 20th April) See the screenshot below. However, here's a question for Jonathan. On these weekly visits to local businesses, have you ever spotted any printing companies? A cursory Google search and I found 17 at least. One of them is Lodge Printers, in Upton, within the constituency. Used by the Lib Dems. Jonathan expresses his local support by getting his leaflet printed in.......Guildford! Putting the postcode of the TPF Group and Conservative HQ in Huntingdon into AA RoutePlanner tells you that Mr. Djanogly, the man who "understands the concerns of companies", rewards local business by handing work to a company in Conservative MP Anne Milton's constituency! On his website, Mr. Djanogly states that this is ".....an exciting period for Huntingdonshire, which presents local people and businesses with big challenges, as well as great opportunities"
Unless, of course, you happen to run a printing firm! Copyright © Jonathan Djanogly, 2010. All rights reserved. Some historical content of this website refers to the period when Jonathan Djanogly was a Member of Parliament. As Parliament has been dissolved there are no Members of Parliament until after the election on 6th May 2010. The campaign is now well underway, and what a few days it has been. 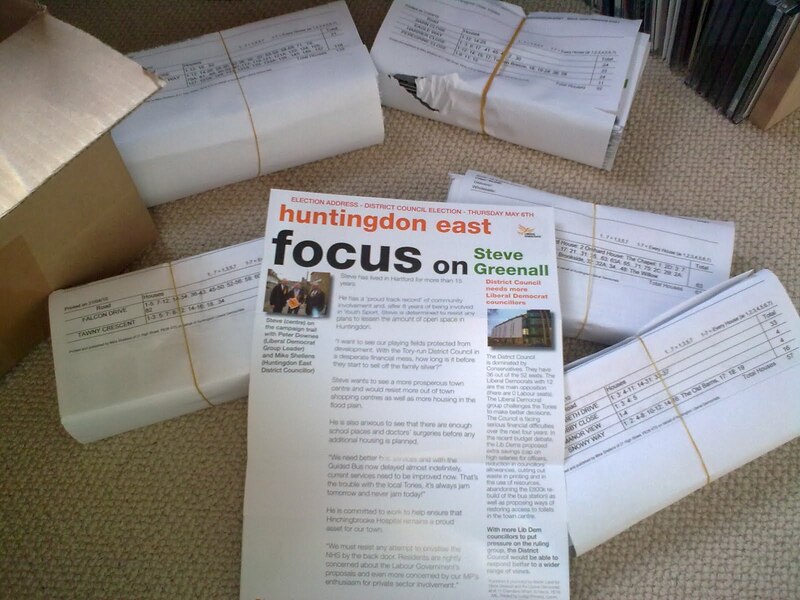 Out canvassing throughout Huntingdon East on Saturday and Sunday, a meeting round at David Lewisohn's house, and afternoon of leaflet sorting on Monday. Visiting the MANY houses with Greenall & Land boards on Sunday....for a first-timer, it's all getting very exciting, and whatever happens, these are thrilling times. I am delighted to welcome Jonny Hyde onto the team. Jonny approached me through the Brampton Spartans connections and he's been a great asset in a short time, setting up my Facebook Group, and assisting with the laborious take of sorting leaflets. Sunday morning began with the usual start when Ben has an early morning kick off for Brampton Spartans under 16s. i.e. Dad gets to provide "cover" for doing the paper round. He's been working for Mr Mahmood at Hartford Village Stores for nearly three years, and the rounds takes in Owl Way, Hawk Drive, Falcon Way, Tawny Crescent and Snowy Way. So, whereas I get the distinct impression that David Cameron only gets on his bike for photo opportunities now and again, I DO use the bike for doing the round, weekly, and in all weathers. Higher up this page you'll see me looking at The Mail on Sunday, of all papers, and the ASTONISHING headline "Clegg Nicks The Top Spot". Let's hope that is still true on May 7th, early hours. As I said, I use the bike for the paper round, but for lots of other things too. If you look closely at the picture below, you'll see a yellow sticker on the bike; a bit tatty now, but proof that I cycled on the "Save Hinchingbrooke Hospital" march a few years ago. Here's a picture taken last Sunday morning just before I went out with the Sunday papers. Yes, that bag is as heavy as it looks! After getting the papers done, I dropped Ben in Brampton for Spartans' game at home to Chatteris, and set about meeting some of the fantastic people who have put up boards in town. And despite what our current local MP said on Radio Cambridgeshire last week, one of the issues that came up a lot was last year's expenses row. However, that was then, this is now.....or should I say, this is Huntingdon East. I am very new to local politics, after Councillor Mike Shellens talked me into standing as a Prospective District Councillor for Huntingdon East for the Liberal Democrats. But I really do feel I have the financial and administrative expertise, plus drive and enthusiasm to make a difference – otherwise I wouldn’t have agreed to try. And so a few weeks ago, I collected the relevant signatures in order to put my name forwards. A whole new set of skills to learn; checking the register, finding out if people want a postal vote, learning about issues "on the doorstep". Actually in reality, it can be, "on the drive" or "at the garage door" but so far, most people have been great to deal with. It is almost inevitable that you will encounter a few who don't agree, or in the case of one guy, don't want to even talk. Fair play.....but those of you who do want to speak, or write to me. My e-mail address is ste.greenall@ntlworld.com. It’s been very eye-opening, hearing what people think, whether that be unhappy at the public loos being closed, the huge costs of Pathfinder House, the “waste of money” guided bus (not my words, a lady in Eagle Way!) But I am getting the feeling that people are happy to support a party which nationally is about fairness but locally, tries to engage with people. And having finished last night at about 8.25, I went home and watched the debates. It is far too early to start to try to guess the impact of the history-making debate between the three main leaders, but for once, I have to agree with what Gordon Brown kept saying. "I have to agree with Nick".